(CNN) -- Carolina Panthers star quarterback Cam Newton has two fractures in his back after a two-vehicle wreck Tuesday, the NFL team said in a statement. He is in fair condition, undergoing tests and will remain in the hospital overnight, the team said. The injury was to Newton's transverse process, a small bone that extends from each vertebra in the back. There were no other internal injuries, the team said. It would be a surprise if he could play Sunday but not out of the question, said Dr. Kenneth Mautner, director of primary care sports medicine at Emory University in Atlanta. "It's not the kind of injury that affects the spine or the nerves so it's a matter of when the pain settles down enough so he can play," said Mautner, who is not involved in Newton's case. Newton was taken to a hospital after the truck he was traveling in crashed in Charlotte, North Carolina, said Charlotte-Mecklenburg Police Department spokesman Rob Tufano. Newton's truck and a sedan were involved in the wreck. "It would appear (Newton's vehicle) rolled over. The accident is being investigated," he said. There was no word on what caused the wreck in uptown Charlotte, a block from Bank of America Stadium, where the Panthers play, but witnesses told CNN affiliate WSOC they saw Newton's vehicle flip four times. WSOC published an image of a dark-colored truck lying on its side in the roadway. A car with damage to its front end was loaded onto a flatbed, CNN affiliate WBTV reported, and Tufano told the station that the driver of the other vehicle was taken to a hospital with minor injuries. 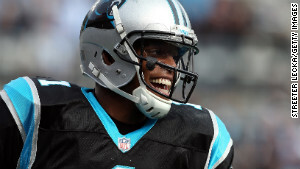 The Charlotte Observer tweeted an image of Newton lying on his side smiling. WBTV reported that Newton was placed on a stretcher and loaded onto an ambulance after the crash, which occurred around 12:30 p.m. A Charlotte police source told the station Newton was not injured and was taken to the hospital only as a precaution. The Carolina Panthers tweeted, "We are closely monitoring the situation of a car wreck involving Cam Newton. We will have more information at an appropriate time." Mautner said the injury is treated similar to a rib injury and Newton likely will wear extra padding during a game to protect the back. He said Dallas Cowboys quarterback Tony Romo had the same injury. Mautner said doctors will advise rest and recuperation and likely will recommend Newton not practice for at least two days, perhaps longer. It can take one to three weeks to for a patient to deal with fractures, Mautner said. Newton shot to fame in 2010, leading the Auburn Tigers to an undefeated national championship season. He went on to win the Heisman Trophy, given to the best player in college football, and was drafted No. 1 by the Panthers in 2011, making him the first player to accomplish all three feats in the same year. After signing a four-year, $22 million deal with the Panthers in 2011, the Atlanta native showed his prowess as both a passer and a rusher, racking up more than 4,000 yards throwing and more than 700 yards running, snaring Rookie of the Year honors. This year, with both Newton and his team beset by injuries, he has put up less impressive numbers, and the Panthers are 4-8-1 going into this weekend's games. He arguably had his best game of the season Sunday against the division rival New Orleans Saints, throwing three touchdown passes and rushing for another. Despite their dismal record, the Panthers are still in the playoff hunt because of the weak competition in the NFC South. CNN's Kevin Dotson and John Newsome contributed to this report.